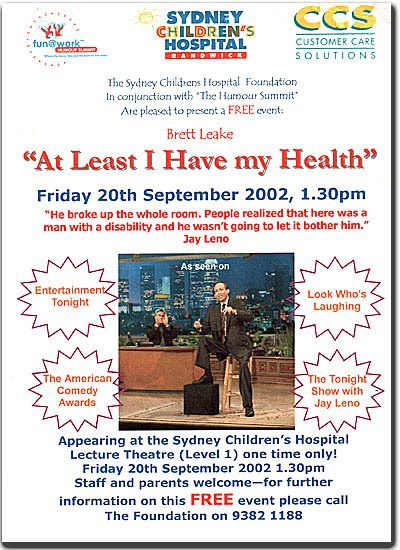 A comedian as motivational healthcare keynote speaker?  Make attendees feel good about themselves and what they are capable of.  Fit well with information-based presentations. Standup comedy and storytelling require an audience’s active participation. Attendees will leave the session energized and aware. When Brett set out to become a comedian, a reporter asked how long a man with muscular dystrophy could stand the rigors of a traveling standup comedy career. Brett predicted about seven years. That was 29 years ago. 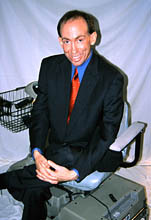 This is the story of a man with a progressive neuromuscular disease overcoming the limitations of his disease - even adding an additional 23 years to his career so far - through the healing power of humor. With intelligence and understated wit, Brett’s comic routine demonstrates the humor-health connection through jokes and stories about the value of humor and managing change. At Least I’ve Got My Health tells of the soft landing achieved by this now sitdown standup comic and of the mental and emotional reward humor has provided in seeing the little and big things in life as laughing matters. Brett uses this experience (Seeing is Creating) for events with a traumatic brain injury focus. A note about the video The Canard and the Caregiver. This video includes a humorous description of an event that occurred during our family's experience with in-home care. While the subject matter is intimate, the language is clean and the tone respectful. Enjoy! Over the years, our highly-rated conference has had many stellar world class speakers. Brett has been one of the most outstanding. 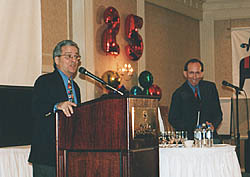 He earned several standing ovations to accompany his high ratings by hundreds of participants (4.97 on a 5.0 scale). People absolutely loved Brett, his message, as well as his way of presenting his message...Here, is a small sampling of the applause that Brett generated on this year’s evaluations. “.... Your message of embracing and leading change was pitch perfect.